A couple of weeks ago, we had the full day on Friday to go for an adventure, and our friend Jessie was able to come along. We decided to do a longer trip to the snow, since winter is going to give way to spring soon, and we have so few days when we can drive to further locations. We packed enough gear for several days, and enough food for a few cars’ worth of people. As we were leaving we grabbed sleds and sunglasses from Fred Meyer, and I’m glad we took the time to stop there. The drive down was otherwise uneventful, except for all the hawks and eagles we spotted. We were in sunshine for most of the drive, but The Mountain was shrouded in impenetrable grey clouds, and we knew we wouldn’t have much chance of good weather. I thought longingly of photos some acquaintances of mine had posted on Facebook just a few days ago – blue skies, sparkling snow, and gorgeous views. Oh well, we would enjoy ourselves anyway! 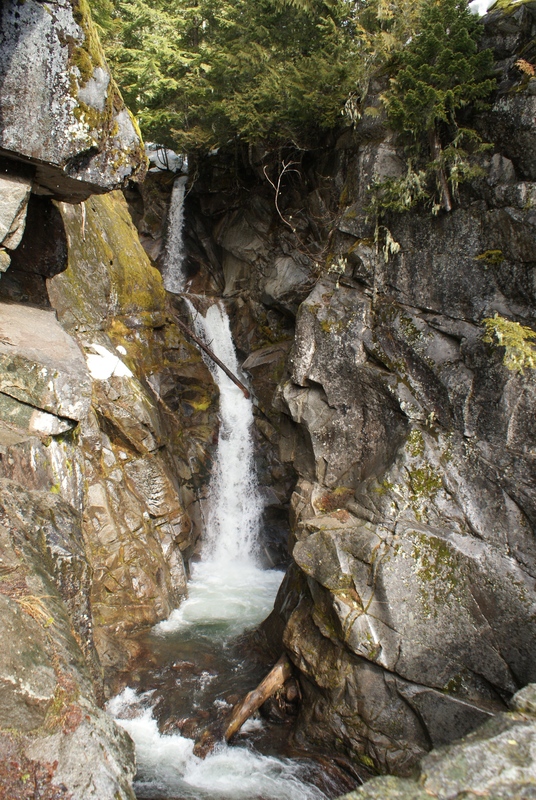 We stopped briefly at Kautz Creek, but drove through Longmire and on up to the Christine Falls overlook, where we took a few photos. When we got up to Paradise, the wind was blowing, and pebbly snow was pelting down. I don’t know all the terms for snow – this was like hail, but not as hard. We couldn’t see much of The Mountain, or of the surrounding terrain. Snowshoeing just didn’t seem very appealing to any of us. So we decided to just go sledding in the groomed sledding area instead. Gabe at the Entrance to the Sledding Area. He Looks so Small! 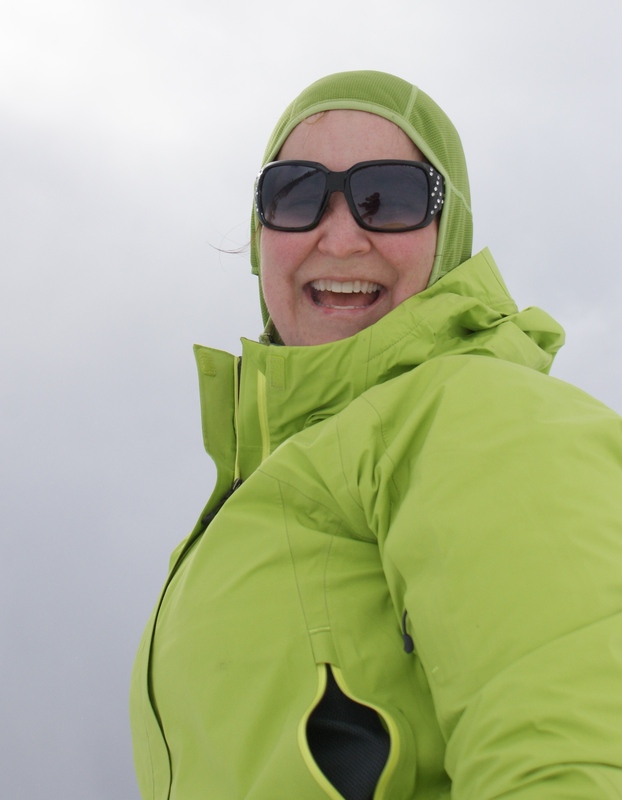 It seems like it takes forever to get snow gear on! Is it like that for anyone else? Then we took the sleds up to the course. There was one other couple up there sledding, but otherwise we had the place to ourselves. 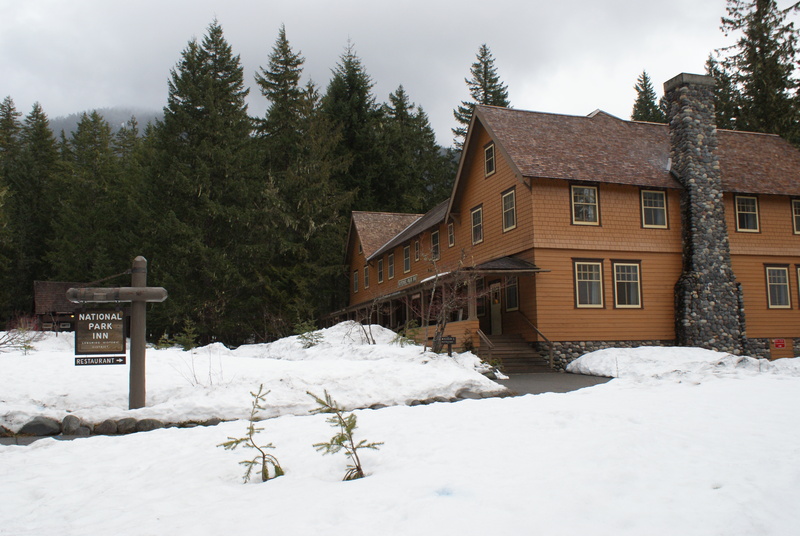 (We admired a family who was getting ready to go snow camping in the area, and watched with wonder as a bedraggled group of climbers came down from higher up the Mountain.) My kids hadn’t really been sledding before, so it took a bit to get them situated, and for them to learn how to get to a seated position without the sled slipping out from under them. 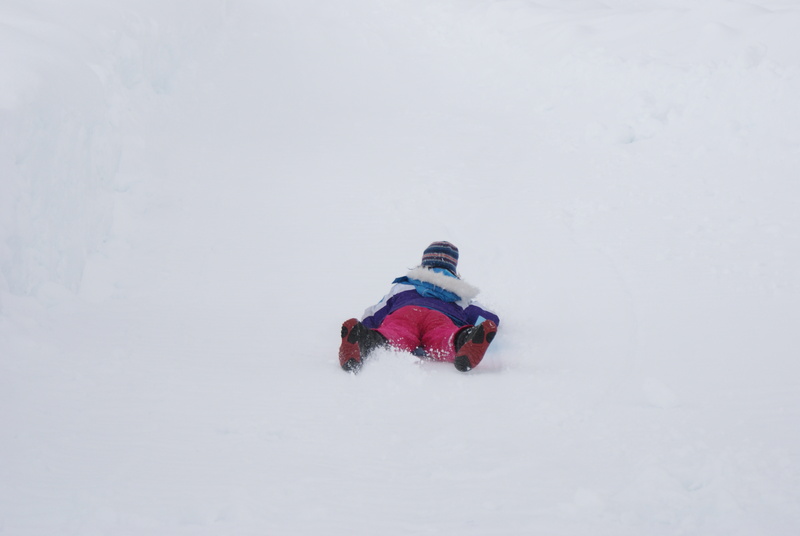 A few tumbles later, and they quickly got the hang of careening down the sled runs. Walking back up became a chore, but we got several runs in before we needed to take a break for lunch. By then, more people were coming to sled, but the parking lot was still mostly empty. We ate in the truck, and realized that the weather was getting worse, and the afternoon was wearing on. We had to decide whether we would get out the snowshoes or try something lower. We decided to go down to Longmire and try one of the hikes out of the main parking area there. 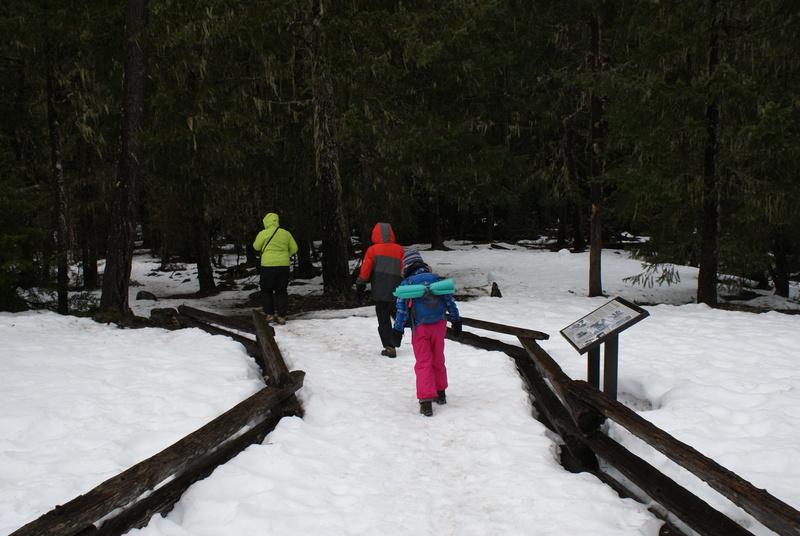 It was a mix of rain and snow as we gathered what we would need for our short Longmire hike. We walked across the street to the Trail of the Shadows, a loop hike of about one mile that passes hot springs and travels around the meadow. There were a few inches of snow on the ground, and bare dirt under the trees. 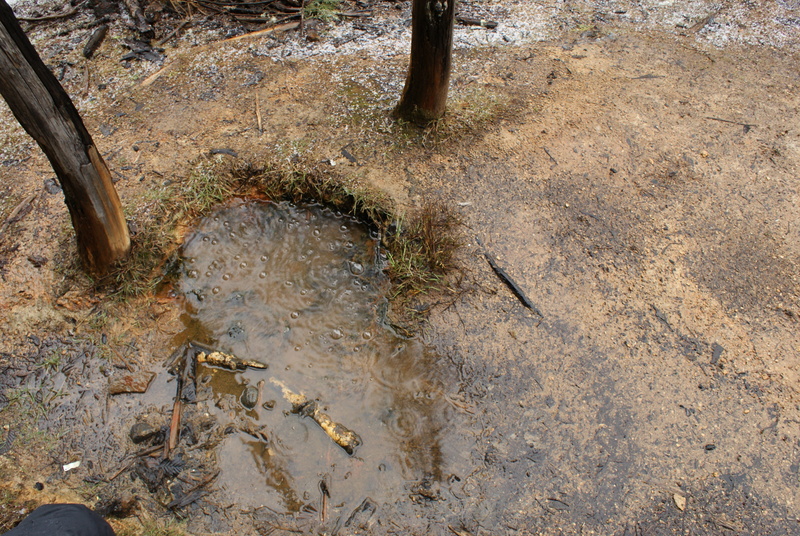 We just wore our boots, but YakTrax or Microspikes would have been nice to have in some places where the snow had been packed down. 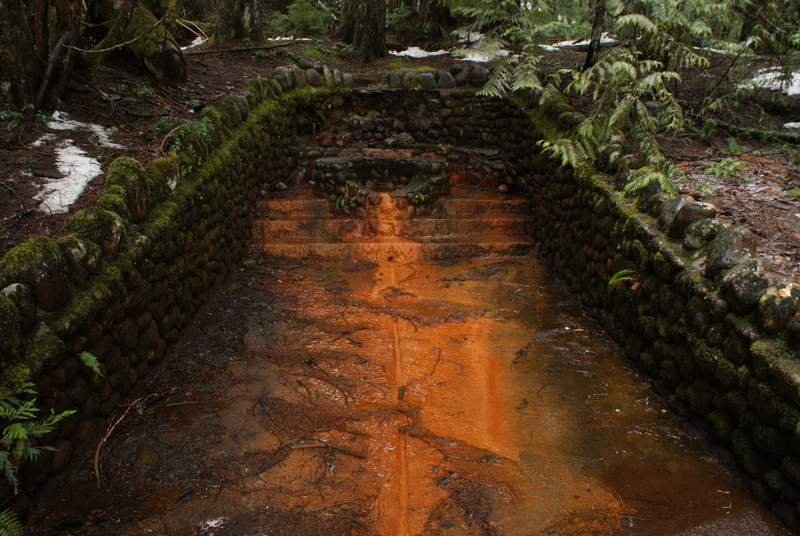 We could smell the strong odor of minerals in some of the streams flowing from the meadow. We read the interpretive signs and looked in the old cabin near the mineral springs, built when the area was first settled by European settlers. After we got a little way around the loop, it started raining harder, mixed with hail. We were reluctant to take our cameras out then. It was fun to be out in the weather, though, knowing the warm truck was waiting just a little ways away. 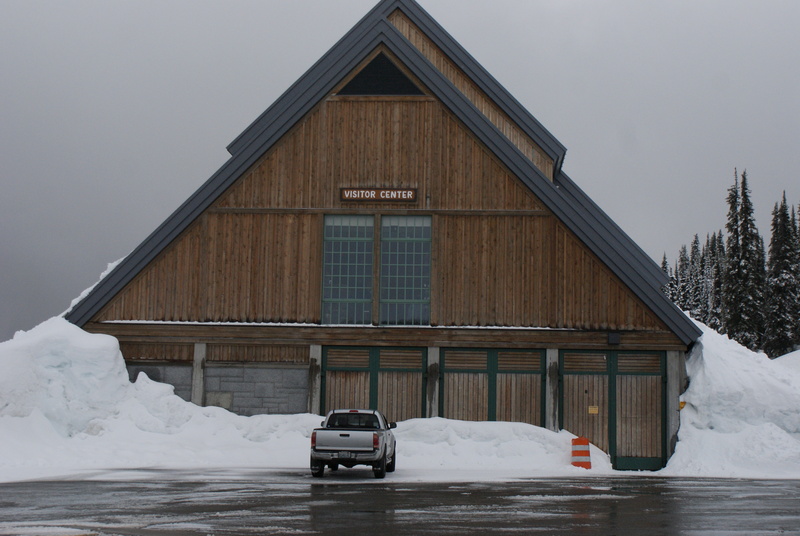 Before we got back in the truck, we stopped in at the Ranger Station, just before they closed. 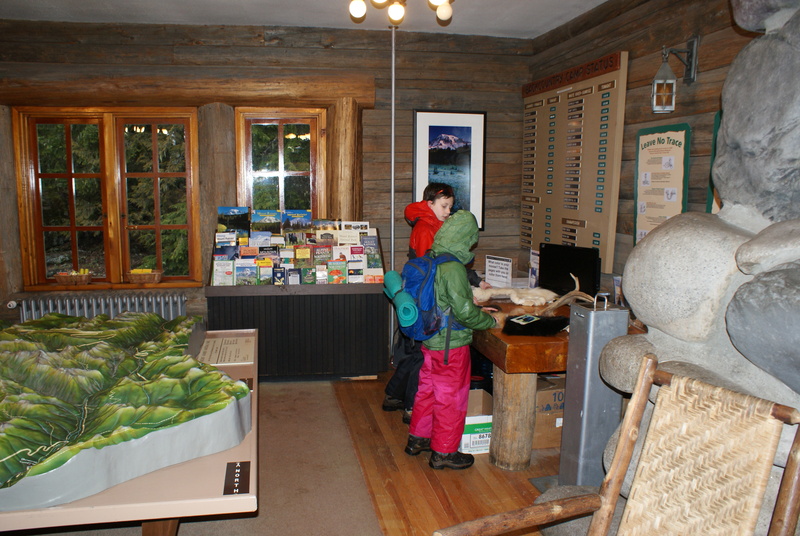 There are a few natural items to look at and touch, and some books you can buy. We found out the museum across the street won’t be open until the summer. We didn’t look inside the lodge or the store. We missed the Friday traffic on the drive home, thankfully. We were so thankful to have Jessie drive, and to share the day with her. It made me much more comfortable knowing her truck could handle any weather or road conditions we might encounter on The Mountain. And it’s really nice to have another adult along to share the responsibilities of being out with kids. Even though we didn’t get to snowshoe, we still had a great day, and got to see one of our favorite parks in a different season than we normally do. 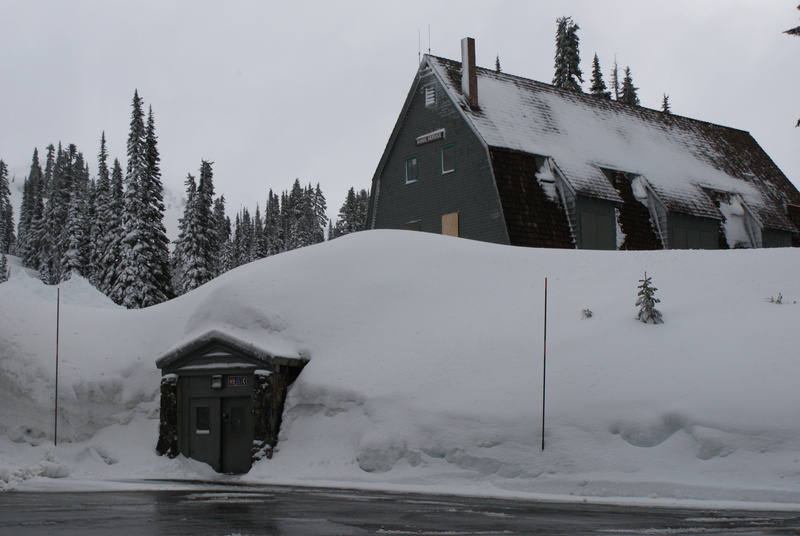 If You Go: Mount Rainier will be in winter garb for a few more months, so make sure you are prepared for varying conditions. 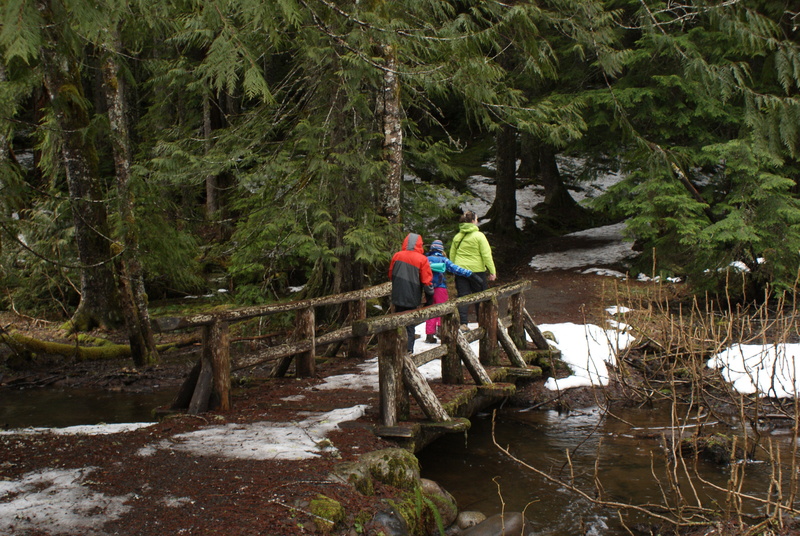 For information on trails out of Longmire, check out this PDF. 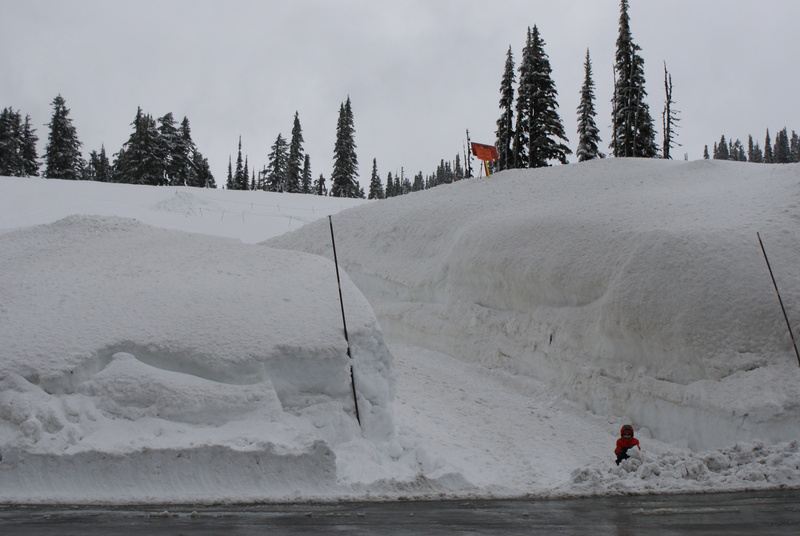 The Snow Play area at Paradise is open on weekends and holidays, but the last day this year is March 30. This webpage has good info about the winter options and warnings for planning your trip. 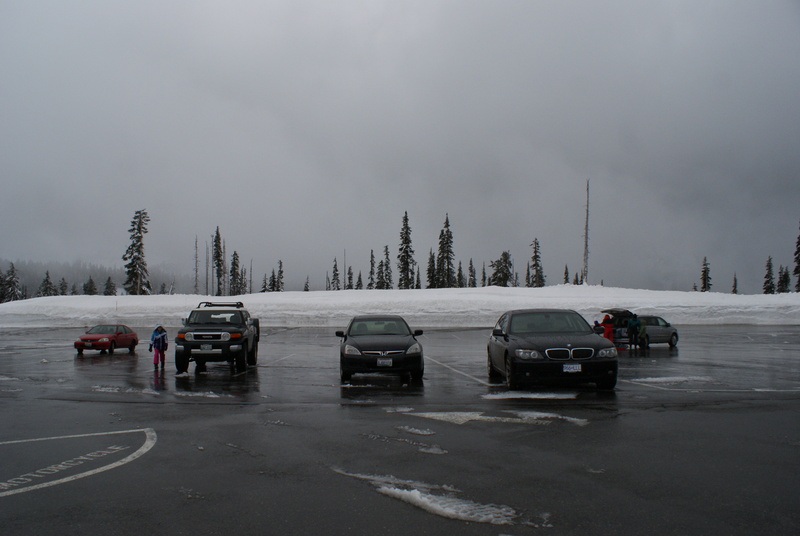 You’ll need to carry chains in your car, and pay attention to the road and weather conditions before you go. Also, the gate at Longmire is closed at 5pm each day, so make sure you are down before that time of you’ll get a ticket. There is road construction going on now between the Nisqually Entrance and Longmire; you can expect delays of 5 to 30 minutes there. 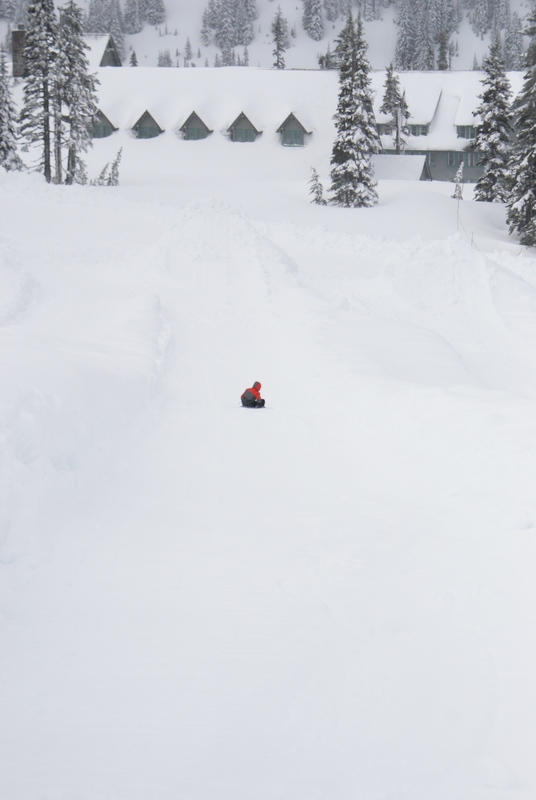 Looks like fun — especially having the sledding area all to yourselves!